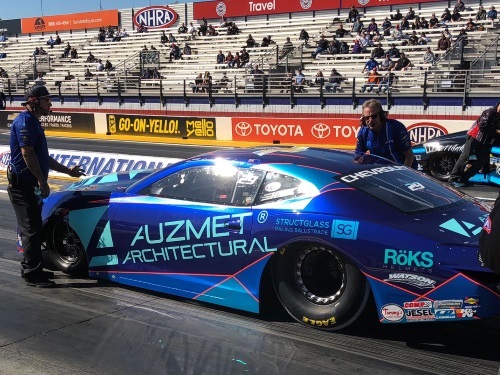 GAINESVILLE, Florida (March 19, 2019) – Shane Tucker and the Auzmet/StructGlass Chevrolet Camaro made the most out of race day after a lengthy rain delay at the 50th annual Amalie Oil NHRA Gatornationals. Starting from the No. 14 qualifying position Tucker used exceptional reaction time skills to narrowly miss reaching the semifinals at the historic event held at Gainesville Raceway. The veteran driver dispatched No. 3 qualifier Matt Hartford before losing to Kenny Delco in a close second round match-up. In the first round Tucker used a starting line reaction time advantage, .048 to .112, to hold off Hartford for the win. His winning time and speed, 6.593 seconds at 209.26 mph were enough to get the win by .04 seconds. The elapsed time and speed combo was also a season best for Tucker. In the quarterfinals Tucker took another starting line advantage and nearly stole another win. The Australian was .032 versus Delco’s .075 and at the stripe Delco’s elapsed time of 6.555 seconds against Tucker’s 6.610 seconds gave him the win by about four feet at over 210 mph. Tucker and the Auzmet/StructGlass Chevrolet Camaro will be back on the track in Las Vegas at the Denso Spark Plugs NHRA Four-Wide Nationals in April 5-7.